Author: Christa Kilian-Hatz. With supplementary material by: Matthias Brenzinger. Series edited by: Wilfrid H.G. Haacke. 10 pp. Roman, 431 pp. The present study is the result of several field studies of the author in Western Caprivi Strip (Northern Namibia) between 1996 and 2002. It is based on the collected material of Oswin Köhler. Additionally, it contains entries of the following sources: botanic terminology by Mathias Schladt (1999), proper names by Matthias Brenzinger (1999) and several entries on material culture by Gertrud Boden and Stefanie Michels (2000). Linguistically speaking, Khwe belongs to the Khoisan language family and is classified as a member of the Central-Khoisan group. Khwe itself can be devided into four dialect groups. Nevertheless as a consequence of the war of liberation in Namibia these four dialects are beginning to merge. As a result, one of the main characteristics of the Khwe language at the moment is the existance of large numbers of variants concerning lexical as well as grammatical morphemes. Khwe evidently seems to be developing a new standard that will include parts of all four dialects, but the language is as yet far from being standardised. Today approximately 8,000 Khwe live in the Caprivi Strip of North-Western Namibia, Angola, Botswana and Sambia, just as 1,600 in Smithsdrift, South Africa. The proper dictionary contains about 5,700 entries consisting of lexical as well as grammatical morphemes. 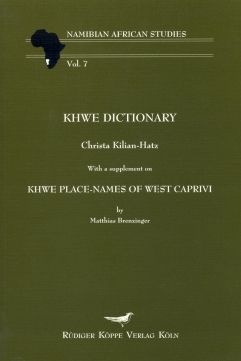 It is preceded by some orthography convention information and is followed by an appendix with ethnonyms, clan, family and proper names just as an article by Matthias Brenzinger which contains a detailed list of place names of Western Caprivi Strip. The supplement together with the main dictionary constitute a valuable piece of work not only on Khwe vocabulary but also the whole culture. It is against this background of a historical and sociolinguistic marginalized speech community that the importance of a lexicographical work such as this Khwe dictionary can be assessed. Recording a language in dictionary form for an endangered language such as Khwe is a milestone in the study and preservation of the language. The compilation of a dictionary, as also an act of language codification, provides a source for important linguistic data and indigenous knowledge systems, and as such is critical to all future research on the language. [...] This dictionary can be recommended to Koisan linguists particularly, and, having a solid base for language development and promotion by the speakers themselves, to community language developers and promoters. This excellent dictionary renders a substantial slice of Khwe vocabulary accessible to a large number of linguists for the first time. It is also important as a sociolinguistic record that captures the lexicon as it currently exists during a period of rapid dialect amalgation that will ultimately produce a new standard form. This book can be highly recommended for Africanists as well as general library collections.